Introducing your new Storage Inventory Ownership Dashboard! Similar to your Inventory details screen, you now have a detailed view of who owns inventory at your sites and changes over time. You can navigate to the new dashboard by clicking the ‘Ownership’ tab within Storage Inventory and selecting an individual position you wish to view in more detail. This section shows the inventory movements that have changed your company ownership quantity for the particular site, grade and season you have selected. The delivery ins and outs are showed with green and red arrows respectively for a clear audit trail. Plus, the movement report is also easily exportable! The gauge chart here gives a quick oversight of the current quantity (by location, grade and season) owned by the selected counterparty. The chart in this section shows the quantity changes due to Inventory Movements over time at your site. 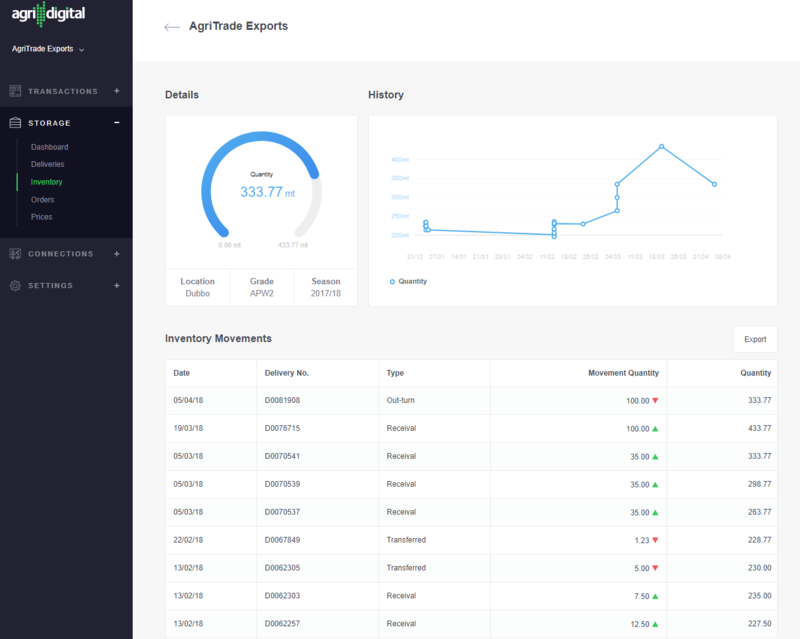 We love to hear your feedback - please contact us at support@agridigital.io to let us know your thoughts on this feature!